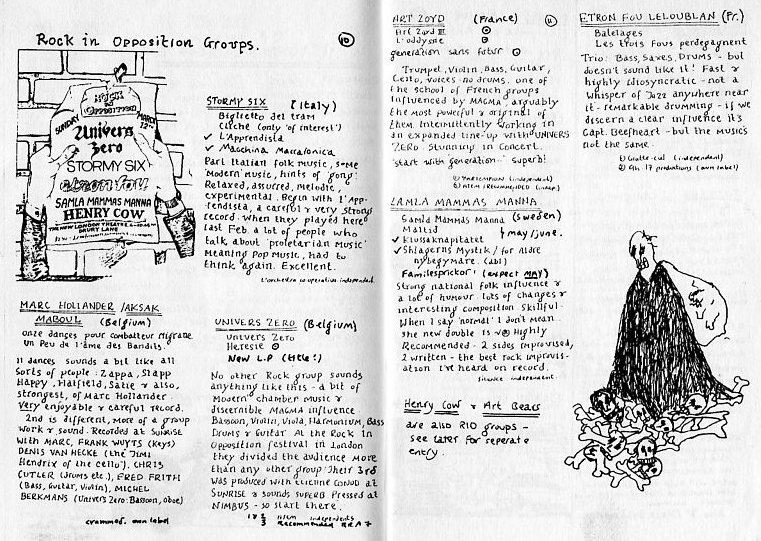 In my previous post, I wrote about the Rock in Opposition collective as it emerged in the late 1970s. I wished to emphasize that it was rather short-lived and by the end of 1979 the R.I.O collective had already dissolved as a formal body. Perhaps some members of the original Rock in Opposition circle would say that it never actually reached a formalized form. The term, however, has lived on and is liberally used in various circles as a descriptive for bands working in the more avant or radical ends of the progressive rock music spectrum. If the spirit and raison d’etre of the Rock in Opposition movement was properly bequeathed anywhere, though, it was to Recommended Records (UK). 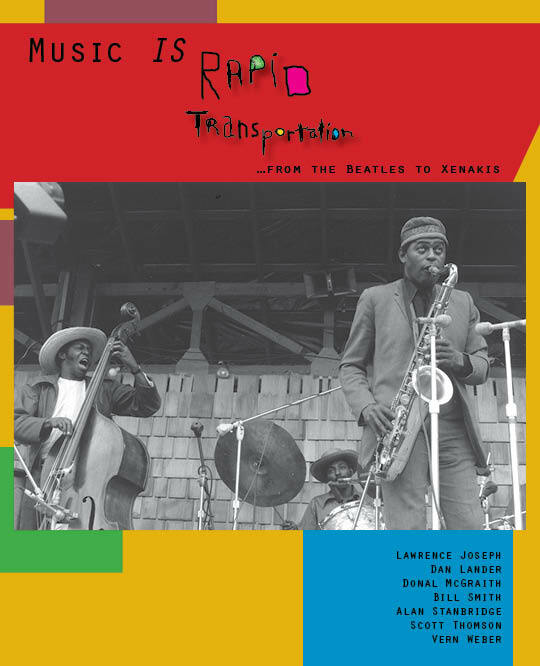 This was an ‘unbusiness’ founded by Chris Cutler (Henry Cow & Art Bears drummer, and participant in Rock in Opposition), dedicated to working outside the established parameters of the corporate music business, making independent releases available, and to cultivating a catalog of excellence selected on the basis of musical merit alone. I became aware of Recommended Records (ReR) in the last months of the 70s, probably at the same time I had become aware of Rock in Opposition. The first ReR catalog I received was the March 1981 Ray Gun Commemorative catalog. (That’s the cover printed above). It was a goldmine of superb recordings, some by artists I had already come across and many others by bands I had never heard of. I started with a small order, followed by another, then another, then another. Each successive order was riding the wave of enthusiasm which rolled in with the previous order. Soon, I had picked up every title in the catalog and kept up with most new releases in successive catalogs. Some of the releases from that particular catalog which became early instant favorites for me were the eps by The Work and Red Balune, Albert Marcoeur’s first two albums, L. Voag’s The Way Out, Eskaton’s Ardeur, and the subscription item for that issue, The Art Bears’ The World as it is Today. 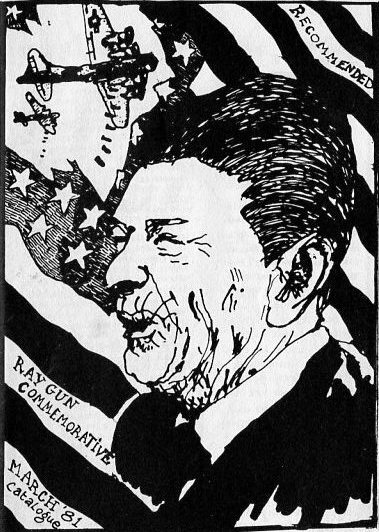 If it’s not clear from the catalog title or image above, Ray Gun is a reference to then US president Ronald Reagan. The UK’s Margaret Thatcher appears on the back cover sporting Nazi regalia. A timely political rant in the form of an editorial introduced the catalog and preceded the music selections. As you can see from the catalog excerpt below, the whole thing was done ‘homemade’ style, hand written and accompanied by hand drawn illustrations. I read the small catalog cover-to-cover a zillion times. At 30 years old this year, the Ray Gun Commemorative has also become one of my longest held possessions. I still keep all of the pre-internet catalogs as cherished keepsakes. Recommended Records, now known as ReR Megacorp, is alive and well today, continuing along its own unique path, still offering a treasure trove of music that is cutting, innovative and independent. Do yourself a favor and check them out. You are currently browsing the Candy Machine blog archives for January, 2011.